Revealing Words follows my research trails exploring the community of St. Cuthbert at Chester-le-Street, Northumbria, in the second half of the tenth century. My starting point is the manuscript Durham Cathedral Library A.IV.19 and the additions made by Aldred and a group of scribes at Chester-le-Street circa 970. † Littera me pandat sermonis fida ministra. Omnes alme meos fratres voce salvta. Translated loosely: May the letter, faithful servant of speech, reveal me. Salute all my brothers with your kindly voice. From that little poem comes the name of this blog, “Revealing Words,” located at litteramepandat. 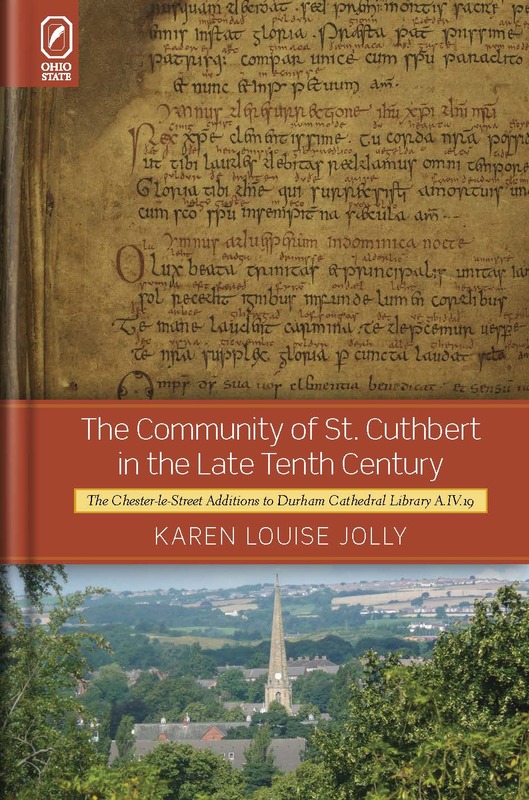 Now that my scholarly book on The Community of St. Cuthbert in the Late Tenth Century: The Chester-le-Street Additions to Durham Cathedral Library A.IV.19 is out, I am turning the research in it toward two projects, one a collaborative database site for liturgical materials, the other a piece of historical fiction, hence this blog. In order to understand some of the prayers added to Durham A.IV.19 and the work of the eclectic group of scribes with Aldred at Chester-le-Street, I began to imagine them as they wrote and interacted with the texts and with each other. I started copying their work with quill on parchment. Then I began to zoom in with GoogleEarth on various locations. Stone carvings and bits of Old English literature began to flow into my thinking. The novel, if that is what it turns out to be, is thus starting with an odd foundation of irregular building blocks. I take a text–Scribe B’s shaky copy of the John poison prayer with Aldred’s corrections, Aldred’s five field prayers, or the colophons–and create a scriptorium scene that helps me get into the characters’ heads. From that, I begin constructing memories and histories for them. No plot yet. The blog categories will be different texts and scenes for exploring the landscape and the characters. I appreciate any comments, corrections, or links that readers provide. I am both intrigued and fascinated by this possible work of historical fiction. Intrigued by the outcome and fascinated by the process of creating such a work. Where does one begin to build fictional lives for real people? How to weave the fictional lives together, and from whose perspective are you planning to tell the story? Would these people have wanted their lives reinvented, would they perhaps be flattered by the attention? Please include the thought process as you embark. I began with what I know–the scribes and what they wrote. Now I am building scenes (places, things, interactions). I am finding that in my first drafts, I tend to “explain” (like a professor!) rather than let ideas and information emerge from the characters and their experiences. Many of those scenes need rewriting, particularly dialogue. So far, I have been using omniscient narrator because that is easiest, although in some sense I also have characters’ perspectives (what they are thinking). I have also invented a sub-plot line of a modern scholar studying the manuscript as I did, and speculating about what it all means: she comes in at the end of chapters and serves as a device to reveal things. I am thinking of posting a draft chapter when I feel a bit more confident. Anyway, I just want to say hello. I’ll look forward to The Community of St. Cuthbert… in July. Thanks, Nicola. I was inspired by your blog as well to pursue the fiction angle and am glad to hear that the first volume of Hild is done. I wonder if Aldred will take me to multiple volumes…. I am looking forward to seeing how this project progresses. I, too, have moved from academic history to an attempt to write fiction, in my case based very much around the same period as Nicola Griffith’s work on Hild. Perhaps you can help me out with a reference or two? I know Bede’s hagiography of St Cuthbert, but are there any other useful early sources? Thanks, Sally, for your encouragement. You might find some useful references on some of the other blog posts: the Historia de Sancto Cuthberto and Symeon of Durham, for example, give details about his posthumous community. Some other sources, other than Bede’s History, might include Sally Crawford’s books on daily life and children in Anglo-Saxon England. Stephan Pollington also has several books on things like mead-halls and warriors. You may be familier with his book on Leechcraft? Thanks Karen. Thanks Michelle. So does your comment on Stephen Pollington mean that you have clocked my interest in the Leech Books? Hello, Karen! I’ve just written a novel set in 900 – The Bone Thief – which was published in Feb this year (under the name of V.M.Whitworth) . It grew out of research challenges I encountered when writing Dying and Death in Later Anglo-Saxon England, and I’m now working on a sequel. (Beware – your project may mushroom and push your real work to the margins!) If you get a chance to look at The Bone Thief, I’d love to know what you think. It’s been well-reviewed on Amazon.co.uk, and in this month’s BBC History Magazine (June 2012) and the paperback is out in August. Will you be coming to Leeds this year? Hi Victoria. Helen Gittos just pointed me to The Bone Thief, which is now on my Amazon wish list for my next round of purchases. I wouldn’t have known you were the author otherwise. My project is already mushrooming, as you say. I will definitely look to The Bone Thief for ideas on how to shape my story. Although I will not be at Leeds, I am aiming to be at ISAS in Dublin next summer. Hello. I’ve been reading your blog and I find it very interesting. I am writing an essay about Bible translation in England and I am presently covering the Anglo-Saxon period, with particular attention to the Lindisfarne Gospels and Aldred’s gloss. Could you be so kind as to suggest some sources about this subject (apart from your own book, which I’ve already requested at my university library)? You may find useful Michelle P. Brown’s The Lindisfarne Gospels: Society, Spirituality, and the Scribe. Although its primary focus is the original manuscript with only a few sections on Aldred’s handiwork, she has a wonderful sense of the community’s spirituality and the role of the Word. Much of the work done on the Old English gloss has been done by linguistics scholars, primarily in articles, and tends to be highly technical (references in my book as well as Brown’s). If you can get access to the 1956 facsimile (Evangeliorum Quattuor Codex Lindisfarnensis. 2 Vols. Edited by T. D. Kendrick, et al. Olten and Lausanne: Urs Graf, 1956–60), you will find a wealth of resources (albeit dated), but the libraries that own it keep it in special collections. The recent facsimile done by Michelle Brown is even more expensive and rarer in university libraries.